For some time DPM reporting has been an area within DPM that has needed improvement. Since DPM version 2007 the community has asked for improved reporting or an easy way to create custom reports to fit their needs. A quick search will yield many forum threads discussing the need for better reporting in DPM. 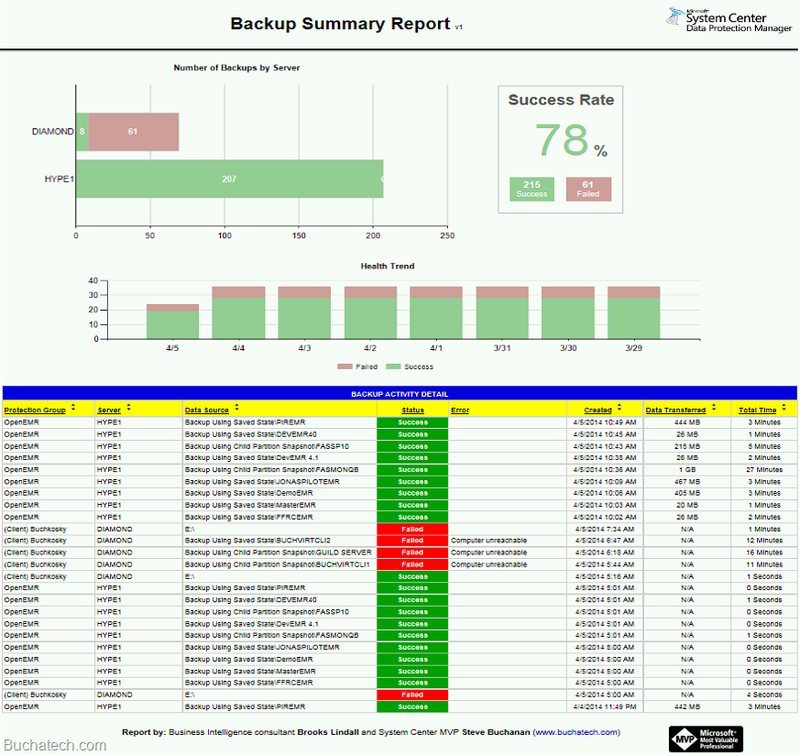 Backup administrators need to get detailed reports on Data Protection Manager (DPM) backups. The reports that are included with DPM are not enough and do not contain the data that is often needed for reporting within organizations. Management of IT departments need to know if backup SLA’s are being met and need backup health trend reports. Backup reports and charts need the functionality to be printed, exported and scheduled. DPM already contains some of this functionality through SQL Reporting Services but as aforementioned the out of the box reports do not contain the needed data or charts. Even with the ability to create custom DPM reports the need for better reporting within DPM has not gone away. Creating custom reports is not a solution that is viable for all backup administrators out there in the community. The solution is not viable for several reasons. The DPM SQL views are limited in the data that they allow someone to pull into a report. Therefore the person building the custom reports would need to write SQL queries to pull the data they need. The second reason is that most backup administrators do not have the SQL skills required to go in and build SQL queries. Backup administrators generally do not have the design skillset to build a report with the right charts, graphs and data using tools like SQL Report Builder or Business Intelligence Design Studio (BIDS). I have teamed up with a buddy of mine that is a business intelligence expert. His name is Brooks Lindall and he is one of the smartest guys I know. A HUGE thanks goes out to him for joining me in trying to solve this problem. 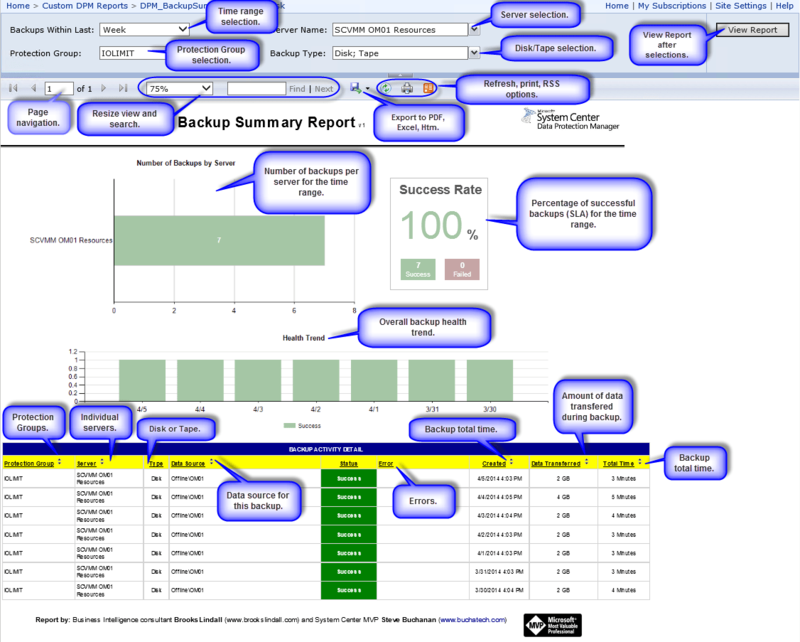 Together we created a solution that is the DPM Backup Summary Report. This report was designed with the community in mind. One goal was to make the report portable to any DPM environment so backup administrators could easily drop it in their environment and start reporting on their DPM data right away. With that in mind this report was built in a generic way so that no modifications to SQL are needed when it is installed. We also set out to incorporate as many of the data points that we could that DPM admins in the community have been asking for. We wanted to fit all of the data in a single view. The last goal was to give this report to the community for free. Special thanks to MVP’s Flemming Riis and Bob Cornelissen for letting me test this report in your DPM environments! I am after a report that includes Azure recovery points. Have you made any progress with this in your own report or are you aware of any other out there? Not yet. I might add that to an update in the future. Keep an eye on the blog for any updates.